15 designs knitted in Snuggly Baby Bamboo DK for boys and girls from 0 to 7 years - a beautiful collection of designs that have taken inspiration from years gone by. For the little ladies there is the cutest pinafore dress and dungarees with frilly straps, pretty dresses with lace yoke detail and gorgeous peplum cardies. Then for the little chaps there are sweaters with funky zig-zag pattern, hoodies with trendy cables and cosy hats. 17 gorgeous designs for babies, boys and girls from birth to 7 years knitted in Snuggly Baby. For little girls there are cardies with dainty lace edges, lace patterned cardies with pretty flower embellishments and gorgeous bootees finished off with bows and roses. Then for little boys there are trendy cable panel sweaters with button detail shoulders and matching bobble hats, textured cardies and a cosy cable panel blanket for perfect nap times. 17 beautiful hand knit designs for babies, boys and girls from birth to 7 years knitted in Sirdar Baby Bamboo. In this book you will find designs that not only will your little ones love to wear but will keep them cosy and warm through the chillier months. There are beautiful cardies with the prettiest patterning for girls and an adorable textured dress with matching bonnet and bootees. Then for the boys there are trendy textured cardies and patterned sweaters. Last, but by no means least there is a collection of the coolest fox accessories; bootees and shoes, a helmet and scarf, all practical and fun. This collection is packed full of 17 fun designs! For the girls we have a cardie with beautiful leaf patterned yoke that comes in both stripy and colour block versions, cardies with gorgeous lace patterns and those with the prettiest of shaped edges. Then for the boys there are textured sweaters with cables and stripes, wrap neck knits and four of the coolest hats around, theres a rather happy looking panda and a floppy eared penguin...adorable! If all of that isnt enough, we have a couple of zingy blankets for your little bundles of joy to snuggle up in after all that fun! 17 gorgeous handknits for boys and girls from birth to 7 years knitted in Sirdar Baby Bamboo which are full of loveable character and charm. We have trendy little knits, such as the alpine inspired cardies and hats for girls and the textured wrap neck sweaters for boys. Then we have the most adorable bunny motif sweaters you will have ever seen. If that wasn't enough we have four bootee designs that are sure to have you cooing - there are tiny Rudolphs, cute little mice, delicate baby bunnies and dinky donkeys! 15 hand knit designs for babies, girls and boys from birth to 7 years knitted in Sirdar Snuggly Baby Bamboo DK. Designs in this book include textured knits for boys as well as trendy wrap neck and cabled designs that older boys are sure to love. There are also the sweetest cardies for girls and moss stitch heart motifs, cardies and hoodies with beautiful little bobbles and the most adorable little pinafore dress. 14 designs in Snuggly Baby Bamboo DK for babies and children from birth to 7 years. 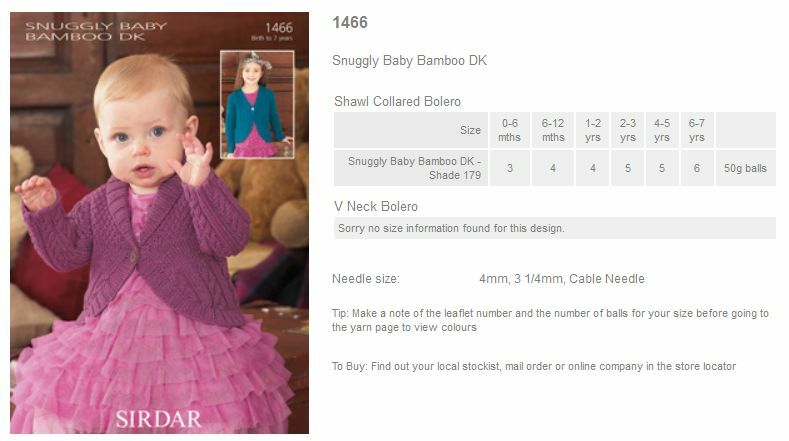 Leaflet with designs for a Shawl Collared Bolero and V Neck Bolero using Sirdar Baby Bamboo DK. 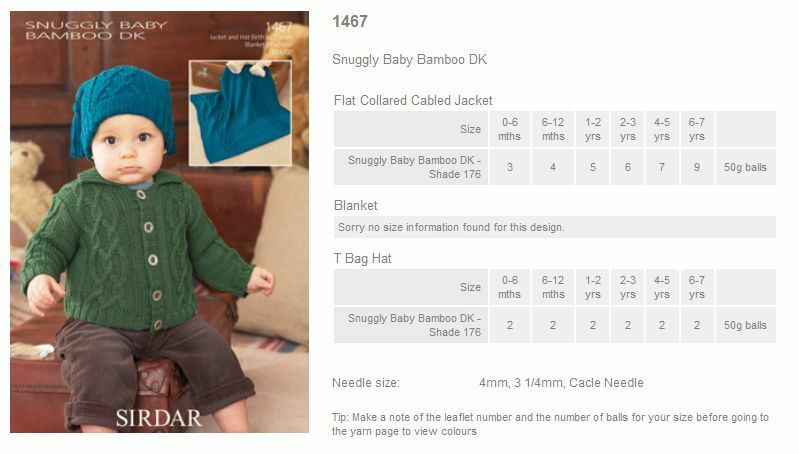 Leaflet with designs for a Flat Collared Cabled Jacket, a Blanket, and T Bag Hat using Sirdar Baby Bamboo DK. 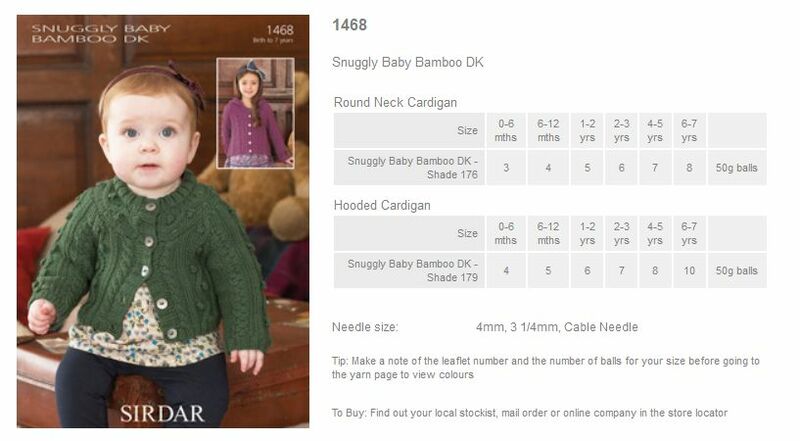 Leaflet with designs for a Round Neck Cardigan and Hooded Cardigan using Sirdar Baby Bamboo DK. Leaflet with designs for a Round Neck Sweater and V Neck Sweater using Sirdar Baby Bamboo DK. 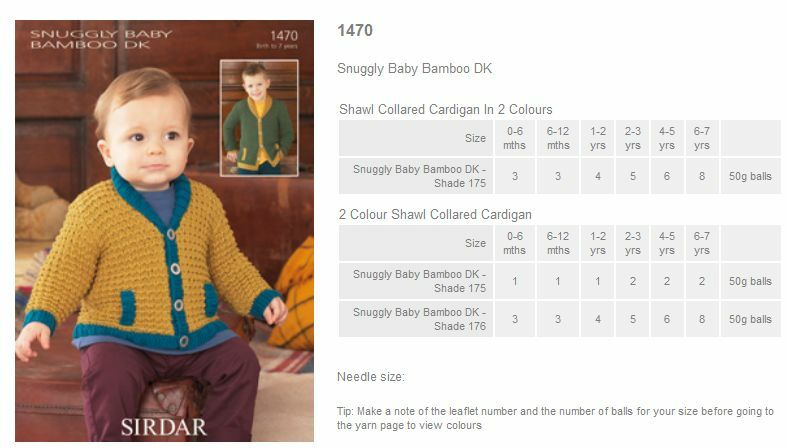 Leaflet with designs for Shawl Collared Cardigans using Sirdar Baby Bamboo DK. 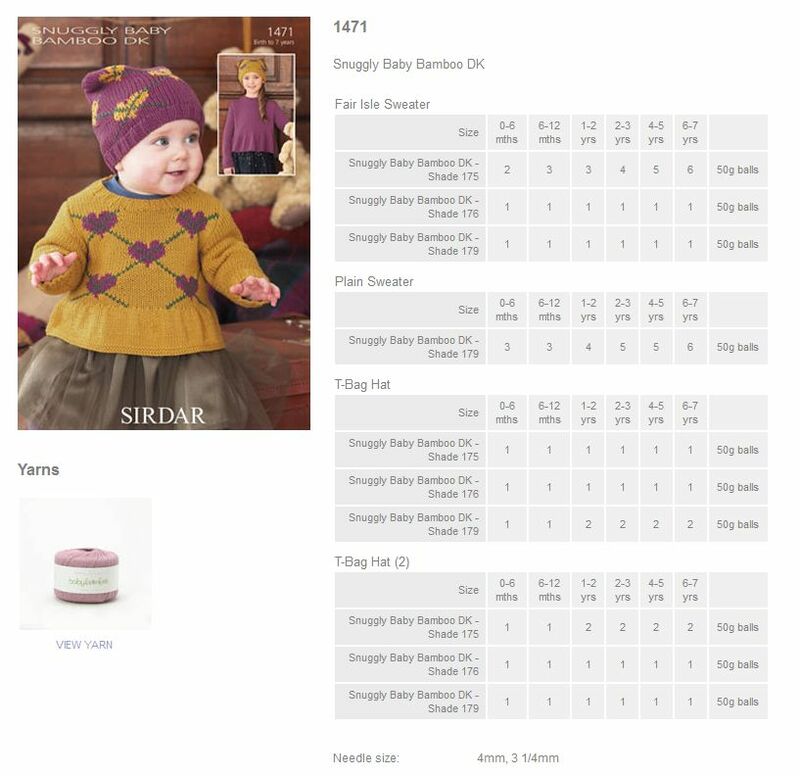 Leaflet with designs for a Fair Isle Sweater, Plain Sweater, and T-Bag Hats using Sirdar Baby Bamboo DK. 14 gorgeously soft hand knits for babies, boys and girls from birth to 7 years using Baby Bamboo DK. Our Baby Vintage collection has the prettiest vintage stitches for a girls leaf-pattern cardie as well as lacy cardies adorned with little flowers. A lacy bonnet with a matching cardie for girls, with hoodies and easy knit cardies for boys. For new arrivals there is a versatile sweater and cardie design for boys and girls. 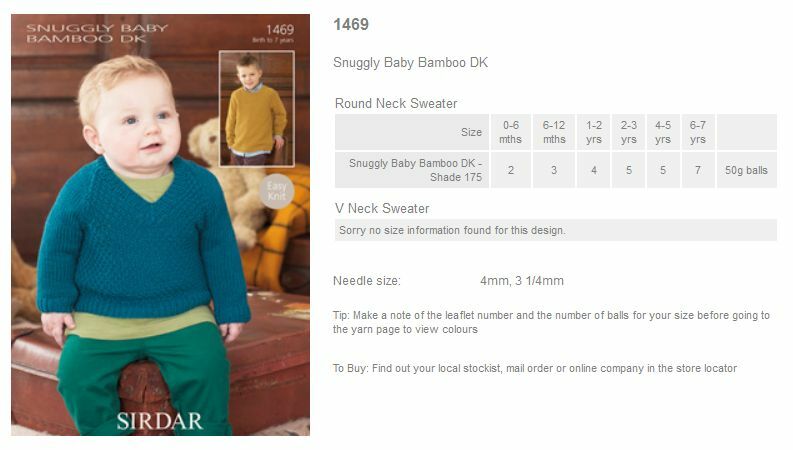 16 trendy designs for girls and boys from birth to 7 years using Sirdar Baby Bamboo DK. This book is bursting with fabulous knits in stunning colours for your little ones to wear for all those exciting birthday parties. There are pretty cardies with hearts and bell edgings for girls and classic little sweaters with matching knitted bow ties for boys. We have a gorgeous baby blanket in an easy knit and purl texture which makes the perfect gift for babys first birthday. 14 hand knits in Snuggly Baby Bamboo Dk for babies, girls and boys from birth to 7 years. For this Little Vintage Knits book there ia a palette of delicious retro colours with gooseberry, pumpkin, raspberry pink and a rich green. For little girls there are fabulous fair isles, beautiful bobbled cardies and pretty cabled knits - and for the boys there are adorable waistcoats with colourful contrast trims and shawl-collared cardies featuring our retro rockin' reindeer motif. 13 hand knits in Snuggly Baby Bamboo Dk for babies, girls & boys from birth to 7 years. Choose from stripey cardies and sporty sweaters for boys and pretty lace stitches embellished with gorgeous knitted flowers for girls. 18 designs in Snuggly Baby Bamboo Dk for babies, girls and boys from birth to 7 years: there are girls cable textures and pretty winter posy cardies - stunning knits for parties. For the boys we have created textured hoodies and cheery cardies to keep them cosy. There are toasty scarves, helmets, and berets beautifully striped in our stunning palette of colours. 15 designs for babies, girls and boys from birth to 7 years in naturally soft Baby Bamboo DK . This book is bursting with happy, bright summer colours and jolly stipes in the trendiest hand knit styles. There are pretty lace cardies and girlie smocks in delicious, zesty greens and zingy pinks for girls and for the boys we have bold blue cables and limey green tanks in sporty boyish styles. 20 designs for babies and children from birth to seven years using Baby Bamboo . We have created a fabulous collection of colourful styles in gloriously rich reds, bold oranges and bright blues for babies, girls and boys from birth to 7 years. There are dashing red, white and blue stripes in girly cardies, shoes and berets, pretty cables cardies for little starlets and easy-to-knit scrunchy textured knits and sporty stripes for the boys. 13 designs in Snuggly Baby Bamboo DK for babies, girls and boys.